SKY MAP: The sky at 10 p.m. local time from mid-northern latitudes this time of year. With the bright Moon having moved out of the evening sky, we now have an opportunity to view some of the fainter sky objects that now occupy our spring evening sky. Looking high overhead and toward the south just after nightfall, is a broad star pattern formed by four stars. The third magnitude star, Cor Caroli, is the faintest of the four that comprise a large diamond frame that can be found high in the sky and due south at around 10 p.m. local daylight time. Remember that the lower the figure of magnitude, the brighter the star. And if you ever wanted to get a good visual idea of star magnitudes, here's some celestial numerology: in this four-star pattern we have that part of the magnitude scale running from 0 down to 3. And not too far away to the southeast of the diamond is Jupiter glowing at magnitude -2.5. Astronomy popularizer Hans A. Rey (1898-1977) called it the "Virgin's Diamond," though others refer to it simply as "The Great Diamond." 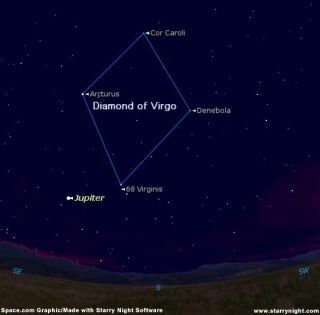 At first glance, the Great Diamond appears to encompass a rather dull region of the sky. The Diamond itself appears about as wide as the Big Dipper and about twice as long. In the upper right part of the Diamond is the faint fuzz of stars belonging to Coma Berenices (Berenice's Hair). But also located within the Diamond is one of the most remarkable areas of the heavens. Sometimes called the Coma-Virgo Cloud of Galaxies, and often referred to in older astronomy texts as "The Field of the Nebulae," it is here that lies a veritable treasure trove of numerous star cities. Thousands of galaxies have been photographed here with great observatory instruments. If you own a good reflecting telescope of at least 6-inch aperture or greater, a sweep of this region will reveal literally dozens of these galaxies appearing as a myriad of faint and fuzzy patches of light. This is the only great cloud of galaxies that is available to the average amateur. Just try to remember that each and every one of these dim blobs is a star city, which likely contains tens of billions of stars! And keep in mind that this cluster or cloud of galaxies is the nearest of the large aggregations of galaxies relative to our own. The best estimates indicate that it is located somewhere between 40 and 70 million light-years from us. So it is possible that as you run across these pale little patches of light in your telescope, irregularly shaped, round or elongated in appearance, that you are gazing upon galaxies whose light may have started toward the Earth around the time of the extinction of the dinosaurs!